Beware! Don’t Name Those Rats. I learned some great lessons from the Summer jobs I took as a kid. 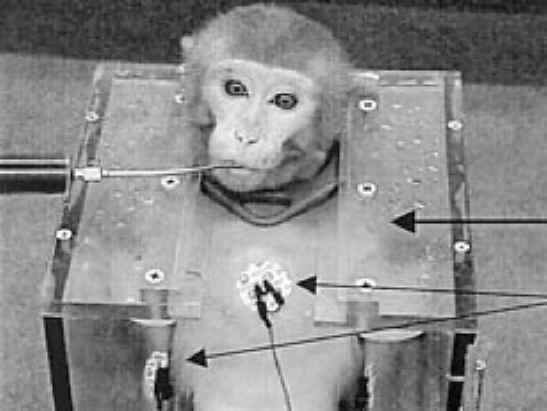 I got a job one Summer with one of the more poorly run animal testing labs, a company called FronckenSchteen Experimentation. 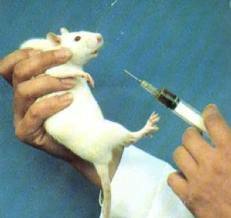 This is me administering the test substance to little Theo, day 2 of the experiment. Frau Brucher, the head lab technician, gave me some advice on my 2nd day on the job. She had just requested that I give the rats, numbers 1-11, their test dosage for the day, and also to administer it to the back up rats which numbered another 5. There was actually a total of 25 rats included in the group for the European study, but these 11 were deemed the best candidates. “Give them their dosage promptly,” she said. “I will start with my favourites, little Theo and Jack,” I joked with her. With such a great CV, it was a Slam Dunk to get myself another job the next Summer. This time it was at the Marlboro Puppies labs. I chose this laboratory because I could tell from the name it would be far more caring of the test subjects. Alas, I was wrong. Little Tommy, Robin and Andrei. But to be fair on the lab, at least this time the beagles seemed to love the experiments. At least, they must have. Every time I’d disconnect them from their machines, it wouldn’t be 30 minutes before they’d start howling for me to put them back on the machines. However, this callousness and lack of empathy I developed at a young age helps greatly when it comes to my current Summer job. You see, around about June 1st every year, Arsene Wenger phones me and starts whining like a big girls blouson about how he needs to make changes but how he doesn’t want to hurt anybody’s feelings. So here is a quiz question for you. 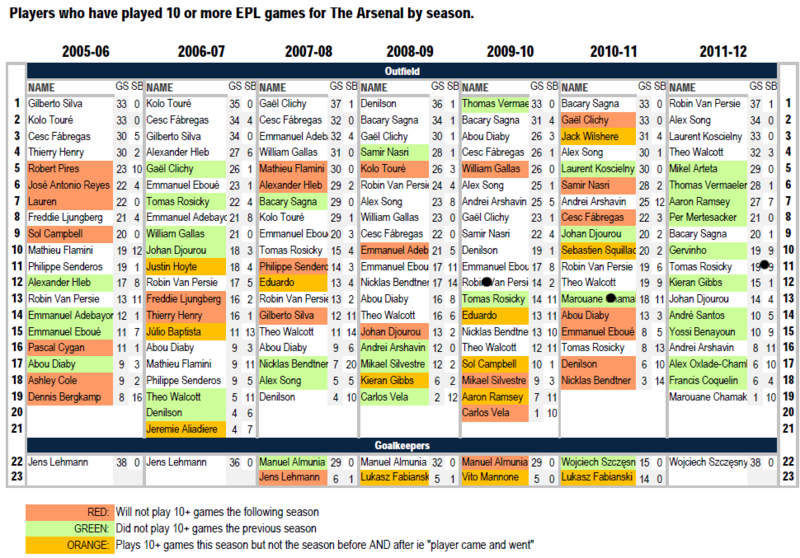 How many new names are in the top 20 players we use in the EPL each year on average. And also, how many new names did we have in 2011/12 in particular. So how many new names for 2011/12? By my count, 10 of the 20. Yep, 10. In fact, the turnover of names from 1 season to the next is typically 5, 6 or 7 names in and similar numbers out. It doesn’t mean they leave the club or don’t play in the squad or for Arsenal in the EPL. It simply means that they play less than 10 games in the EPL for us which I have arbitrarily deemed to be a cut-off point for significant contribution. Exercise #2: Write down right now the list of the top 20 players you predict for next season. Put it in a drawer. And be prepared to amaze yourself by checking it on Sept 1st, 2012 and then again on May 31st, 2013, because we know nothing right now. We haven’t an earthly. Still, all this twitter speculation keeps us out of organized crime gangs and prostitution rings. So that’s a plus. Remember: DON’T NAME THE RATS if you have a tendency to form strong attachments to Arsenal’s players. The needles are long and pointy. ← We Wear The White Hats. Good blog made me chuckle! good article, I can’t deny I’m guilty of this a little, tryna change it though. good one u on twitter? Love this blog. I think unlike last season We gunners are not hiting any panic buttons.